Though I hate to speak for other people, I think it’s relatively safe to say that the customs, beliefs, and traditions of the Shinto religion are often not well understood in the West and, therefore, it’s a bit difficult to get a handle on the accuracy of its portrayal in anime, manga, and movies. The good news is that even Japanese people don’t understand it all that well, and very often you’ll see vague scenes of “spirits” all passed off under the Shinto umbrella. That’s actually what’s going on with the fire-reading (also known as pyromancy)1 scenes at the Hikawa shrine, where Rei uses the power of fire to consult with spirits and to get an understanding for what’s currently happening elsewhere or about to happen. What do I mean? Well, let’s get started! The unfortunate and short answer to this question is that, quite simply, Shinto has no traditions of fire-reading or even smoke-reading. In fact, with the exception of the o-mikuji (paper strips telling the bearer’s fortune for the upcoming year or near future)2 that you can get at a shrine, the Shinto faith (if you can call it that) doesn’t really believe in telling the future at all. Shinto deals in the past (the connection between the god’s who created the Earth and their lineage through the reigning emperor) and the present (the spirits or gods which inhabit everything around us), but it has no real concept of the future or even much of an afterlife. For that reason alone, the many scenes of Rei kneeling down and consulting the great fire are a bit out of place, to say the least. That’s not to say that fire-reading is completely without precedent in Japan, of course! A form of fire-reading – or, more accurately, pyromancy – was practiced in ancient China (and by connection, Japan) through what was known as oracle bones.3 The fortune teller would etch questions onto animal bones or turtle shells, put them into a fire, the bones/shells would heat up and explode, and then they would analyze how it broke and try to divine the future. This, however, fell out of practice a long time ago, with the last known examples showing up in the Zhou dynasty4 in China—around 771BC. That being said, the practice isn’t entirely unheard of in Japan, even if it doesn’t have connection to Shinto as it’s actively practiced today. In fact, the city of Oyabe in Toyama prefecture5 holds an annual festival in January in which they bring together the dried husks from the rice harvest, bundle them into a giant tower, and burn them as part of a festival in order to see what the coming year holds. 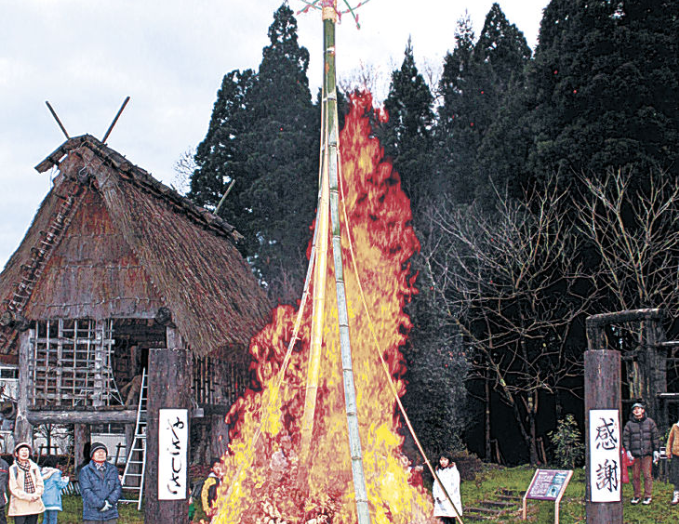 There are also other so-called fire festivals (左義長; sagichou)6 held throughout Japan during January that date back to 1251 AD, but these are more symbolic festivals that have to do with lighting up the dark winter and bringing luck through the coming year, and less to do with trying to engage in any sort of fortune telling. So what does this ultimately tell us? Is Rei’s fire-reading a sham or some sort of mistake made by Ms. Takeuchi and the creators of the Sailor Moon anime? Not at all! Pyromancy is very much a real form of fortune-telling (ignoring for a second whether or not we believe fortune-telling is real) and it’s even mentioned in Act 3 of the manga that it’s Rei herself who is spiritual and has mysterious powers, not exactly the connection to the Shinto shrine itself. It would only make sense that Rei, being the Sailor Soldier of fire, would find affinity with fire and would use it to focus her natural spiritual abilities. Rei is also seen doing tarot card reading on several occasions in the manga, so it’s not out of the realm of possibility that she practices many different forms of fortune telling in order to channel her own connection with the spirits. 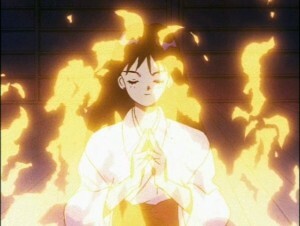 I guess the take-home lesson here is that while the fire meditation / fire-reading that Rei does throughout the Sailor Moon series may not actually be a part of the Shinto faith, it’s not entirely heard of in Japanese history and, moreover, ties directly into her role as the Sailor Mars: Soldier of Fire. 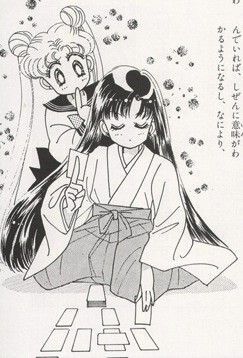 More likely than not, as with the tarot cards she uses on several occasions throughout the manga, it’s more a manner of giving her something to focus on to center herself (much like how Ami uses swimming). In the end, it probably doesn’t really matter, but it’s at least nice to know that it’s a part of Rei as a character, and not a part of the greater Shinto connection! Read also: Is Rei's Grandfather From Her Mother or Father's Side? ← Was There an Actual Crown Game Center? I’ve long been fascinated by Rei’s abilities, it seemed like there was some kind of untold story behind them. Since they manifested long before she met the others, I’ve always seen them as something she adapted into her arsenal. Rather then simply something her past incarnation possessed. In every continuity they’re sort of taken for granted. Not to mention any kind of wariness or hostility towards them kind of dissipates immediately after her debut. To my knowledge only the R movie makes a passing reference to that. I’d liked to have seen that played up a bit more. I find it really interesting that her first appearance in the manga builds up her mystery with parents coming and asking her to find lost children, etc. and everyone talks about her and her visions as if they were a common occurrence and like she has some sort of mystical powers. Even the Black Moon arc briefly touches on this during the school festival, but for the most part Rei’s mystical powers are just kind of ignored outside of the occasional vision or premonition. 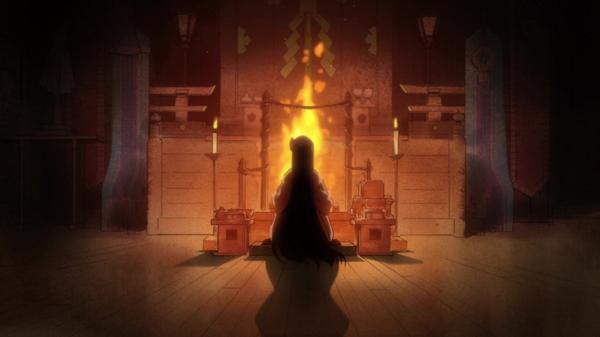 I’ve always wanted to know more about the fire reading (which is why I actually researched Shinto and fire-reading traditions in the first place) and her connection to spirits, but it’s sadly ignored in the series for the most part. It seems like there’s so much lost potential there, what with her mother having died during child birth. You think they could play up that angle of her mother watching over her and giving her powers, right?? I’ve actually come up with my own idea for an unofficial explanation. One of her ancestors (possibly her grandmother or even mother if you prefer) was some kind of benevolent spirit, such as a ‘Zenko Kitsune’. Basically she/he marries into the family and some of those supernatural gifts pass down to Rei. I’ve been doing a bit of reading into Japanese Mythology, and there is a link between them and Shinto (Inari Ōkami). For example, they can serve as protectors to shrines, ward off evil, and are often associated with fire. Which fits tidily in with her powers. Perhaps she’s unknowingly communicating with it when fire reading, or maybe it’s even partially charging her ofuda? Either way it’s a potentially interesting idea to explore, and it doesn’t conflict with any kind of established canon. Given how fantasy based the Sailor Moon series is, I don’t think its entirely outside the realms of plausibility. Since neither Naoko or anyone (sadly) seem to have any plans to explore that aspect anytime soon. I rather like this idea of Rei’s abilities coming from something otherworldly. Since Sailor Moon is primarily a fantasy, it fits well with the established world.